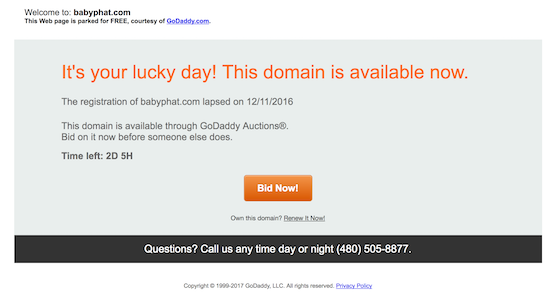 It looks like the BabyPhat.com domain name has expired and is currently up for auction at GoDaddy Auctions. The domain name had been associated with the once popular Baby Phat clothing and footwear brand. Wikipedia also states the revenue for Baby Phat is $980 million, but I have no idea if that figure is current. Prior to the expiration of BabyPhat.com, the registrant organization appears to be a footwear company. The email address within the Whois record is for a marketing or branding agency. I am not sure how they are affiliated with each other. I always recommend that people and companies use their own email addresses for Whois records rather than a web developer or marketing agency since the registrant email address receives important renewal notices. As of right now, the high bid for BabyPhat.com is $3,250 and there are 65 bids. With this domain name matching the name of a brand, I would imagine this would be a risky purchase (I am not a lawyer or law expert though!). Because the domain name is at auction on GoDaddy Auctions, the registrant still has time to renew the domain name. A waste of money, IMHO. Got renewed. Most likely from your article. Nice work. Correct, the domain was renewed until 2026. Last Monday we contacted the guys at Kellwood, which owns BabyPhat, to inform them about the situation, after some verification they took action. Domain was renewed right after the auction. I’m pretty sure the domain wasn’t renewed on purpose, as they knew it was a high profile domain that would go to auction. They were testing the market to see what someone would pay for it. Then they renewed after getting a closing price. Domainers do it all the time. The BabyPhat brand is dead. It was sold off a long time ago. Russell and Kimora Simmons have nothing to do with it anymore. The luster is gone and many of their trademarks have been abandoned. Many of their TM for “Baby Phat” are still there and getting renewed, so you are wrong. I don’t need to contact Kellwood. You’re either easily misled or maybe you just want to look like the person who “saved the day” by informing them of the domain being at auction (which they already knew) … Or maybe you have some kind of interest in making these claims, so the brand doesn’t look abandoned. Do your research. I’m already very familiar with the BabyPhat brand, which is now basically dead. BabyPhat has let 35 Trademarks die and there are 15 left … all are in decline. A company who lets 35 trademarks die, is not a company that’s thriving or planning to continue business. They would be renewing and protecting their trademarks. They would have an active e-commerce website at BabyPhat.com, like they did in the past and they definitely wouldn’t have let the Trademark dot com go to auction. The brand name “BabyPhat” was licensed out to BP clothing, which filed bankruptcy due to poor sales and surrendered the brand back to Phat Fashions, which is owned by Kellwood. Anyone who knows the fashion business, especially brands that are created by celebrities and what happens when those celebrities sell the brand and walk away – already knew that the brand was in decline when ownership changed hands and all the licensing came into play. Other than this, there are just waaaay to many obvious clues as to why this brand is dead. Like I said … do your research before you open your mouth … you’re embarrassing yourself. When I spoke on the phone to someone senior at the footwear company to which the domain name was registered, she had no idea the domain name expired and was very appreciative. If you have a look at the Whois history you can see it is registered to a footwear company but the email is affiliated with a marketing firm. I don’t see any utility to letting the domain name expire rather than paying $1 to renew. The domain name is worth very little to someone without the active trademarks, as it would become more of a liability. It is a moot point though and there are no bonus points for being right or wrong in the comment section of my website. I think you should read again what I wrote. I have been covering fashion companies for many years, as an equity analyst for nearly 20 years, and I perfectly know Baby Phat history. I neither said it was a thriving company, nor that its business is active at the moment. Phat Fashions, which included Phat Farm (menswear) and Baby Phat (womenswear, designed by Kimora Lee Simmons) was sold by Russell Simmons to Kellwood in 2004 for $140 mln. Kimora Lee Simmons was fired in 2010 to cut costs, in a situation of already heavily declining sales and operating results. BP Clothing LLC, which owned Baby Phat license, went bankrupt in 2011 and surrendered Baby Phat operations back to its licensor Kellwood, that’s true, I never said something different. Actually there were 70 “Baby Phat” and derived TMs in US alone (Source: USPTO), of which 23 are still alive and being renewed, in Nice Classes 3,6,9, 18, 25 and 26. In 2013 Kellwood was close to sell Baby Phat to a third party and according to a breach of contract lawsuit filed by a Singapore retailer, who stopped receiving merchandise from Kellwood, Kellwood was planning to end production of Baby Phat in January 2013 and did not intend to restart it. It looks like that the alleged buyer at that time was not interested in selling apparel with the Baby Phat brand, but only accessories, such as handbags. But at the end Kellwood did not sell the brand. Anthony L&S, LLC (Anthony Loconte and family) is the licensee for the Baby Phat and Phat Farm shoes/footwear category. AL&S Footwear appears in all the domain Contacts, while Admin email is from Kellwood. IMHO that should mean that, at least for the time being, Kellwood is just keeping the brand mainly for licensing purposes, especially in the accessories business. That’s why they don’t “have an active e-commerce website at BabyPhat.com, like they did in the past”. Unfortunately for you, I’m not “easily misled” and I don’t care about “look like the person who “saved the day”. Research, fashion and finance have been my job for at least 20 years, so I don’t need lessons from you, thanks. The truth is that they forgot to renew the domain by mistake, you have no evidence whatsoever that they already knew that the domain was being auctioned by GoDaddy, and what said Elliot confirms my view. As far as I can see, Elliot called AL&S Footwear in NY, who is the licensee, while we informed the guys at Kellwood, who owns brand and TMs. Looks like the one who embarrassed yourself it’s you … we always do our own research and due diligence. The domain has a lot of value to someone who knows what to do with it. The name Baby Phat can be legally used anywhere outside of where the current Trademark owner has secured a mark. Baby Phat stands for “Baby Pretty Hot And Tempting”. It’s also a reference to voluptuos women. It doesn’t take a rocket scientist to see where a name like this could be used OUTSIDE of fashion, among other places, with new branding, new focus, and a new direction that has nothing to do with fashion, it’s celebrity creators or any of it’s current marks. Anyone right now could start using Baby Phat for something completely different and secure a mark. The meaning of Baby Phat is not exclusive to this once great fashion brand. The company AL&S that you are referring to is a Baby Phat licensor, who also doesn’t have a working website. These are new email addresses appearing now. They were not there before and even now they include Kellwood. What trademark owner, especially the trademark owner of a brand that was once worth 9-figures, would allow one of it’s licensors to control the actual trademark domain? … There’s more to the story … a lot more. No one at Kellwood or AL&S is going to offer you this information. The value in letting the domain go to auction is to see how many eyes are on it. Who would be willing to pay for it and how much. Even if it somehow got to the press, it would be some eyeballs being turned they’re way. Someone willing to pay a lot for the domain, just might be interested in a licensing deal. This is all easy to understand. I have no idea about the history or status of the brand. Again, this is all a moot point. I don’t have a horse in this and don’t really care. Someone associated with Baby Phat cared enough to renew the domain name and nothing else is pertinent. Sure, TMs just apply to specific Nice classes of products/services and geographical regions. To put it short, anyone can file a TM for “Baby Phat” provided that the application is for products/services/regions not already covered by current live TMs and that there is not a risk of operating in “confusing similar” activities. So “Baby Phat” could also be used outside of fashion. You are wrong. While name and address on the domain Whois are those of AL&S Footwear, the domain is controlled by Kellwood, who has its own email as Admin Contact, not by AL&S Footwear. Admin Contact controls and manages the domain. Tech Contact email is Kellwood’s as well. That means AL&S Footwear can’t move the domain without Kellwood approval. Let me tell you that letting the domain expire and going through GoDaddy Auctions in order to get more “public exposure” with potential third parties interested in a licensing deal makes no sense, because IMHO the exposure to the “right” parties is very limited, if any. There are better venues, ways and timing to get the right exposure with that goal in mind.